Fear is one of the fastest-acting tactics to motivate someone into doing something (It’s also one of the ones that wears off the quickest). Some religions use fear to motivate people to adherence, scaring them with the possibility of what would happen to them if they don’t adhere. I was surfing YouTube and came across this video, put out by thisSt. Brigitta web site from Sweden. Holy crap! Imagine a kid watching that! I once was taken by a friend to what was purported to be “like a haunted house, but it’s even scarier because its at an old church.” What it ended up being was a place called “Hellstop,” where church members put on a realistic outdoor walk-through of the fate of a car accident victim who hadn’t accepted Christ. The guests were escorted through the woods and into a mock “hell” complete with lakes of fire, Satan screaming at you from a throne, people in cages, etc. It literally scared the hell out of me as a kid. I thought I had to make sure I prayed extra hard so that didn’t happen to me. When a non-Christian dies, exactly what is Hell supposed to be like? I would encourage readers to leave a comment as to what you think Hell would be like. Does the human spirit feel pain in Hell? If so, how, given the lack of a functioning central nervous system. 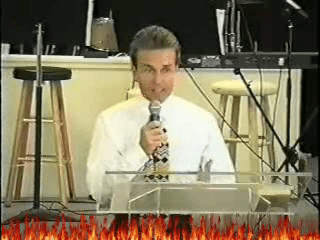 Are inhabitants of Hell made to work for Satan? If so, what is Satan’s job? And what does the work entail? Is it like a prison chain gang, where rocks are broken and piled only to be knocked over and piled again? It doesn’t seem like this is a productive use of Satan’s workforce. Where is hell? Is it near the core of the Earth? If so, how does one retain any moisture in the body at 7,000 degrees Kelvin? What’s Hell like in your mind? Bill Wiese is a scam artist. He claims that he went to hell for exactly 23 minutes and now has written a book and spends his life lecturing about his experience in hell. Here’s a link to the guy’s web site. My first thought was – “Okay, so this guy had a nightmare and now is getting rich by convincing people it was true?” If that’s the case, I could make a great deal of money lecturing people on the dangers of going to school naked. But first I want to address a couple things, questions that might be in your mind. The first question that would be in mine, if I was listening to me, would be, “How do you know it wasn’t just a dream that you had? A Bad dream?” A couple points to make, first of all, I had left my body. I saw my body when I returned, lying on the floor. So I know for sure it was an out of body experience. Some Christians have said, “Oh a Christian can’t leave his body.” But that’s not true, In 2 Corinthians 12:2, when Paul was caught up into the third heaven, He said, “whether in the body, or out of the body I do not know.” So if he didn’t know that must mean it’s possible. And also he said in verse 1 that it was a vision, so I believe this comes under the classification of a vision. Christianity’s motivation for morality is fear. There is no better example than Bill Wiese. Christians want to be good because of fear that if they don’t they will be put into a burning place to work for eternity. They will define what “hell” would be like in Earthly terms – fire, etc. Yet to describe what “heaven” would be like is supposedly beyond what we can comprehend. What a load of garbage. Your religion is based on fear. That’s weak. Sorry I’ve just been posting videos lately. I’m in the middle of the spring tour and haven’t had much time to dedicate to TGR lately. You are currently browsing the archives for the YouTube Videos category.